Speeches delivered by heads of states and government officials focused on the war of words between North Korea and the United States; the chaotic political and economic situation in Venezuela; climate change; forced migration and its economic effects on countries; conflict zones; and the ongoing wave of terrorism in the world. Traditional rivals India and Pakistan tried to play the blame game on state terrorism issues. These statements were in stark contrast to UN Secretary General Guterres’s opening remarks. Worse, the statements from India and Pakistan’s representatives did nothing to highlight the many shared issues and problems the two South East Asian nations face: terrorism, unemployment, water and sanitation problems, poverty and low literacy rates, hate speech, difficulties in the democratic process, civil military relations, foreign policy, and a complex relationship with neighboring countries. This diplomatic faux pas, committed on the of the world’s most prestigious international forums, raises several questions about the efficacy of Pakistan’s foreign policy. To make matters worse, the Pakistani delegation used a three-year-old photograph of a Palestinian girl, Rawya Abu, being harassed by soldiers in Gaza as a supposed example of Indian brutalities in the disputed Kashmir region. Is this Pakistan’s diplomacy at the world’s largest forum? Are Pakistani diplomats still living in the Middle Ages and do not want to improve their efficiency in global affairs? By eschewing fact-checking, Lodhi weakened Pakistan’s position over Kashmir. 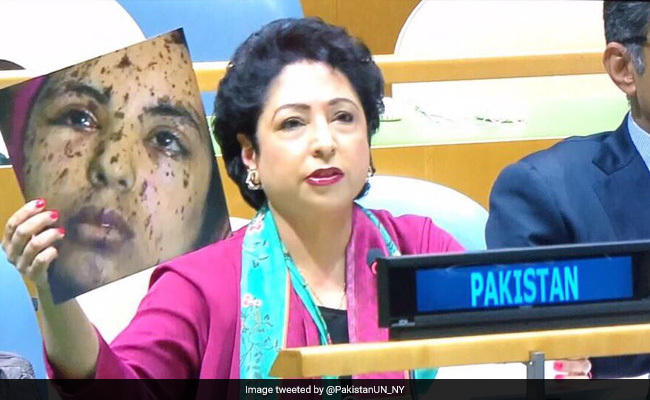 Nobody might care at all about the Pakistani delegation’s speech, but people do care about a fake photo being showed at UNGA. Pakistan does not only need to present their Kashmir claim with solid proof, but also needs to do effective diplomacy with all the stakeholders involved in Kashmir and international bodies to solve this regional tension. Pakistan must work with its allies and neighboring countries through diplomacy on several issues. These types of cheap tactics cannot help but damage the country’s reputation. The nation should train all diplomats on how to deal with crisis situations like this. They also should work on new tools of public diplomacy and should consider all of them according to their potential for successful diplomacy. Narrow minded approach from both sides! It is irony to consider the fact that the way of representation of both these countries through the world is not only based on rivalry, but they have lost their nerves to what extent thay can go to play blame game against each! So pathetic, and I hope they should avert focus from degrading others, and learn to enjoin to collaborate for better future of people of both countries,and to learn lesson from other nations like European Union! Dear Mubeen, certainly yes, we need to learn lessons from the other developed nations as well as from our own past experiences. Both nations fought and lost lives, economy and much more and got nothing except remaining poverty, unemployment, illiteracy and many social problems. That would be great ! Thank you! These are the acts which always set Pakistan to go to back foot. Research and Facts should be presented at this kind of international forum. Foreign policy should be revised and clear. Dear Azhar, foreign policy is clear but the problem with diplomats and their seriousness towards most important issues of state. The must trained diplomats to handle crisis situation at world forums. Being a journalist I am traind to investigates first and then cross check the evidence of story so I am very annoyed on Pakistani diplomate Lodhi who spent her life as a cradible journalist so why she did not eximine facts . 2nd thing both countries are playing blame game but india playing it with effective way of diplomacy and believe on tell a lie until it becomes truth . The two countries are completely failed in understanding the fact that the more they will cry against each other at International forums, the international lobbies will take advantage of the fragmented situations in South Asia. If the two focus on the above said agendas to solve their internal issues the countries wouldn't need to create havoc of blame game. Yes, we need to solve our problems internally without the intervention of international bodies, but sometimes we do need but not a way they want on this issue. Its all about the blame game played by both states at International Forum . I don't know why the intelligent Lady Dr. Maleeha Lodhi was failed to present Kashmir issue in an appropriate way . I don't know why she used the fake photo about the stance of Human rights violation of Kashmir . Both states does not show maturities at World level . They are standing at the stage of rivalry . The way of presenting Stance of Kashmir with fake photo diplomacy downs / downed the position of Pakistan . The dire need of Diplomats of Pakistan to be trained and try to evacuate the diplomats from old age and they must present the view of Kashmir efficiently otherwise it loses / lost their standard value of Kashmir dispute . sooner or later they have to be.